We went to a fantastic swap meet at the Kitsilano Community Centre and got some amazing stuff at super duper prices. Among our proud purchases were a couple of old school board games. When we got home, we cracked one of the board games open and started playing it. Smarty Pants loved it and we had more fun than Paris Hilton at a birthday bash. All this board game fun got me thinking – whatever happened to family fun playing board games? Do you ever hear of families having fun together playing board games anymore? I’m sure there are families out there with older kids that have family board game fun, but do any parents out there with 3 or 4 year olds play board games with them? Some of my fondest childhood memories are of playing board games with my family and friends. Whether Scrabble, Monopoly, Sorry, or Checkers, I was on those games like a fat kid on french fries. I’ve spoken to many parents who share the same sentiments. Board games are fun, educational, and provide the perfect opportunity to bond with, and teach, your kids. Most importantly, you can play them with young kids too. I asked the owner of our local toy store recently why he doesn’t carry any board games for young kids. His answer: They don’t sell well. Why? Because parents more often buy something that their young kids can play with independently. Board games are more work and take more time and involvement. Maybe parents also don’t realise that you can play a board game with a three or four year old, or can’t be bothered to try. This is a reflection of how changing times affect our family activities and the time we spend bonding with our kids. In our hectic lives, we would rather hand our kids something that will occupy them than take the time to sit and play a game with them. It’s a pity, because board games are fun, and are the perfect opportunity to spend time with your kids. Think back to your own childhood, and I’m sure you can remember having family fun over a beloved board game. If you have a young child, try playing a simple board game with her. I guarantee you a fun, bonding, experience. Enchanted Forest: We bought this game at the swap meet and it looks awesome. It is a Ravensburger game, so you know you can’t go wrong. The game involves looking for treasures under trees in the forest, and remembering where they are to report them back to the King. Different variations of the game can be played, depending on the age level. 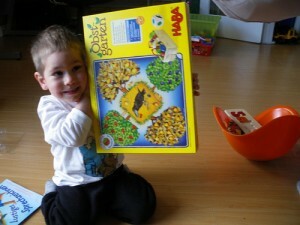 For younger children, you can play a simple version that just involves collecting the trees as you move along the board. The more complex version (which is great for when the kids get a bit older) involves memory, strategy, and the use of “magic.” I’m really looking forward to playing this one! Smarty Pants already had a great time setting up the little wooden trees on the colourful board, and laying out the magical cards. The Squirrel Game: Another one from Ravensburger that we got at the swap meet. We recently played this together and had a blast. This game comes with little squirrels carrying wheelbarrows, a bunch of little pine cones, the game board, and special die. Each player is a squirrel, running around the game board collecting pine cones to bring back home. You collect the pine cones in your little wheelbarrow. When you have more than six pine cones in your wheelbarrow, you have to dump them out because it is too heavy for the squirrel to carry. If you meet another player along the way, you can either take up to three of his pine cones, or give him up to three of your pine cones to lighten your load – which adds a bit of strategy to the game. The player that collects the most pine cones at his home wins. It’s really cute game that I don’t think is on the market any longer, unfortunately. Orchard (Obstgarten): This is a cool game from the German toy titanic “Haba” – one of the best toy companies in the world. This game is a top seller in Germany and Austria, but doesn’t seem to be as well known in North America. We have it and have had lots of fun playing it. It is a cooperative game, where you roll a nice wooden die, and depending on the colour you roll, you pick a wooden fruit from a tree and put it in your basket (e.g. if you roll red, you pick a cherry, if you roll green, you pick an apple, etc.) If you roll “the Raven”, then you put a piece of the raven puzzle together. If the raven puzzle is built before all the players collect all the fruit, then the raven wins. If you collect all the fruit before the raven puzzle is complete, then all the players win. We have a lot of fun with this and it is great for learning about fruits and colours. The little baskets for collecting the fruit are really cute, and the pieces are all high quality solid wood. I also like that this is a cooperative game. So there you have it, some fun ideas to get you started back in the world of board games and to help you revive your family board game night. Do you have a favourite board game or childhood board game memory? Do you agree that parents don’t generally try to play board games with younger kids? Leave a comment and let us know! Board games are great! We try to make sure that every Sunday night we have pizza and game night. It’s nice to not have to worry about dinner and then getting ready for the week. With just pizza we have plenty of time to play games. Really is a great time. @smartfather – that is really great to hear! I like the idea of combining it with ordering pizza too, to give you more time to play. That sounds like a lot of fun and a real treat. I hope more parents take your example! @Ashley – thanks for your comment – you’re right, at 2 yrs old, swinging and playing outside is much more fun . Our son just started to “get” board games recently, around the time of his 3rd birthday. He’s still learning the concept, but he has a lot of fun with it and wants to play again and again and again. Every time we play a game, he gets better and shows a better understanding of what to do, when its his turn to roll the dice, etc. It is a great time to teach him and spend time together. I wrote an article titled “Top 5 Ways to Get Games Cheap” that also addresses great ways to get some games for very little money down. Feel free to share with your readers if you think they would be interested. Check out a game called “Loopin’ Louie”; it’s a dexterity game that works equally well with kids and adults. William´s last blog ..The Admiral is a Cylon!